Located next to the C&O Canal and the Potomac River, the Center’s spectacular natural setting is ideal for relaxation. Conference facilities with golf course views and a one-of-a-kind mix of amenities provide unique experiences for your next business meeting, departmental retreat or large corporate function. Our catering and team-building team work with you to create unforgettable cohesion building experiences for your group. Picture perfect ballrooms with floor to ceiling windows, outdoor patio with golf course background and well maintained grounds provide a memorable location for your special occasion. Bretton Woods is a 2017 Couples Choice Award Winner. Bretton Woods Recreation Center has been creating memories and building friendships for area youth with day camps that incorporate sporting and educational interests in a country club setting for over 25 years. Our Main Pool features 2 diving boards, a water slide and a mushroom waterfall. We also have an adult only Lap Pool, a Baby Pool, Volleyball courts and a Playground. Our 15 acre outdoor area offers 2 Zip Lines, a Giant Swing, Ropes Course, Self-Guided Nature Trail, camping/ primitive skills area and much more that allows members and guests the opportunity to host adventure parties, learn about the environment, and host team building events. Our scenic and secluded Tennis Facilities offer 4 hard courts, 8 Har-Tru clay courts and 2 year-round indoor courts. Our Tennis Pavilions are the meeting area for Summer Camp & most adventure programs. A playground is also available for use at these facilities. Two regulation size soccer fields allow members and guests to play anywhere from 7-aside to 11-aside. 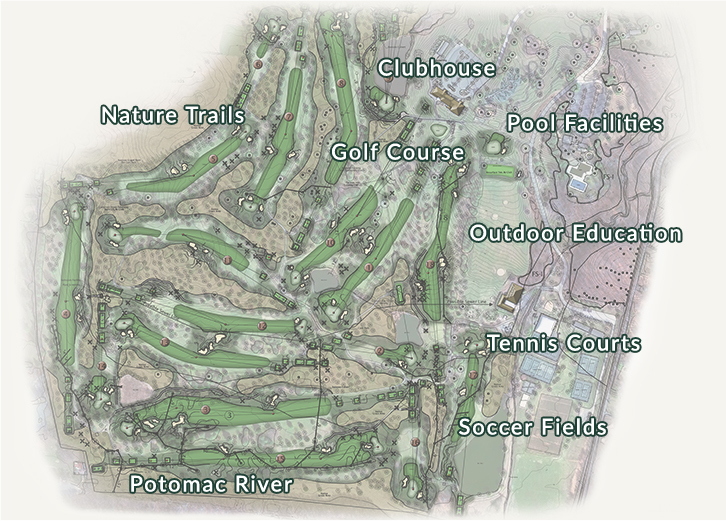 Our property allows access the C&O Canal trail & the Potomac River through gate located near the soccer fields. The River is where members and guests canoe, tube, and Stand -Up Paddleboard. A 1.5 mile walking trail with natural vegetation and wildlife lets you escape into a relaxing and serene environment. With 285 acres of manicured turf and mature trees, visitors can experience golf, tennis, soccer, swimming and many other activities. Summer Camp Registration is here! Summer Day Camp, Adventure Camp, Golf Camp, Tennis Camp and Soccer Camp. Sign up for the camp that fits your child’s interests. Our conference facilities and rope courses provide a great balance for your departmental or group retreat. Bretton Woods seeks to provide its members with a quality destination, that offers a variety of sports, social activities and dining in a relaxed, inclusive and family-friendly setting.